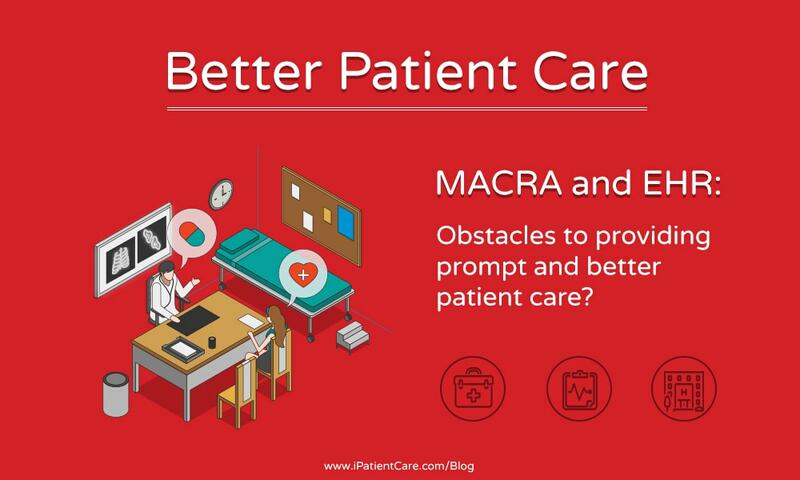 MACRA and EHR: Obstacles to providing prompt and better patient care? It seems, like ever-changing rules and regulations in the healthcare industry regarding quality-reporting programs like MACRA can be mind-blogging. Also trying to fill information in the EHR can sometimes be stressful if the physician is not completely familiar with the software. Most of the physicians are thinking that value-based reimbursement is a good thing for healthcare since then they are only spending money on the care that provides value. But many physicians disagree and suggest that this value-based reimbursement will not make any difference. Thus, the benefits of MACRA and EHR software are overlooked. Many initiatives in the health care today would not be possible without the programs like MACRA and the implementation of the EHR Software. EHR is an excellent resource to save patient data, reminders and patient-specific analytics. For example, it is potentially valuable to recognize the record systems employed by telemedicine providers may provide useful lessons into how EHR systems can be re-created to enhance rather than hinder, healthcare. All consults, whether voice or video are recorded and can be played back by both, the patients and the physicians. This helps to improve both process and skills of the physician staff. Another example is, MACRA has moved all the physicians into Quality Payment Programs, using certified EHR. It emphasizes on data exchange and flexibility. It has proved to improve the interoperability of all the practices. There is always a new opportunity available for the personalized treatment. Some basic clinical decision support (CDS) was available to the doctors earlier. It was closer to the electric reference materials than they were to truly personalized medicine; based on a patient’s unique health data that could provide high-quality clinical decision support at the point of care. For example, a doctor kept a screenshot of every clinical decision support or medication alert he received which helped save or improve the life of his patient. This was a great reminder of why technology could be a great asset to providers and their patients. These personalized medicine initiatives are constructed by the EHRs and quality reporting programs like MACRA. Till to date, many government programs have failed at providing true health data interoperability, we were not even talking about widespread sharing of health data in the paper world. Faxing individual medical record was acceptable when it came to data sharing. Prior to MACRA and EHR, this possibility seemed far-fetched even to consider. Many organizations have taken a huge step forward in their privacy and security efforts. The work of security and privacy is never done, but organizations are more aware today of risks than they were 5-10 years ago. This credit goes to the HIPAA risk assessment requirement. MACRA and EHR software have helped to improve patient care and healthcare in general. A lot of improvements are still required in this software. Even security and privacy are still a challenge, we should not let the search for perfection inhibit us from acknowledging progress. Thus MACRA and EHR are far from being an obstacle to providing patient care. In each of these areas, healthcare has made huge progress and many patients and doctors have benefited. Just as EHR is getting better in a wide variety of ways that have improved patient care today, it will form the basis for improved patient care in the future too.